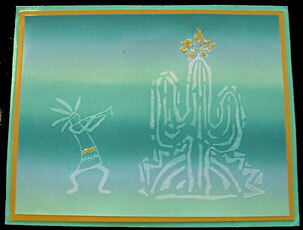 Stamp Kokopelli and Star Cactus on white glossy card stock using Clear Resist Ink. Brayer over images using Fresh Green Kaleidacolor. Add gold glitter glue to Kokopelli’s belt and Star. Layer onto matching card stock, or use this as your main card.